This is a Government created by Sinhala Buddhists and it must remain Sinhala Buddhist, the Buddhist extremist organization Bodu Bala Sena resolved at a massive rally in Maharagama yesterday. In an address charged with provocative ethno-religious rhetoric, Bodu Bala Sena General Secretary Galaboda Aththe Gnanasara Thero urged President Mahinda Rajapaksa to ensure the protection of the “sacred Sinhala franchise” that swept him into power. Thousands of supporters and representatives of the Bodu Bala Sena gathered at the Maharagama Junction last afternoon for the organizations grand convention. Clad in white or t-shirts bearing a ‘No-Halal’ slogan, the supporters carried Buddhist flags and cheered enthusiastically when extremist Bodu Bala Sena monks denounced alleged Muslim extremism, referred to the community’s conservative clothing as ‘gonibilla’ outfits and called for a total ban on halal products by 31 March. Police anti-riot squads were deployed for crowd control after a monk led demonstration resulted in an attack on a Muslim-owned enterprise in the town in January. 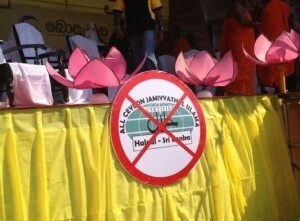 The organization also unveiled what they called a ‘historic’ Maharagama Declaration, a 10 point resolution that seeks to impose a ban on halal certified foods, sending Lankan women to the Middle East, mosque-building with Middle Eastern funds and certain birth control methods that they claimed were aimed at stunting the Sinhalese population. The monks alleged that 80,000 Sri Lankan migrant workers in the Middle East had been converted to Islam and claimed that several organizations operating in Sri Lanka were receiving Middle Eastern funding to convert Buddhists in the island. Issuing an ultimatum to the Government, the Bodu Bala Sena General Secretary said the organization would give the administration until 31 March to ban the halal certification. “Don’t make us take the law into our own hands,” the monk said, pledging to commence a relentless anti-halal campaign until the Government announced the ban. “From today onwards, each of you must become an unofficial civilian police force against Muslim extremism. These so-called democrats are destroying the Sinhala race,” Gnanasara Thero charged at the crowds, who cheered in response. He said pluralistic values had robbed the Sinhala people of money, jobs and enterprise. “This is a Sinhala country; there is a global principle that minorities must reside in a country in a manner that does not threaten the majority race and its identity,” the leading Bodu Bala Sena monk said. Gnanasara Thero told the crowd that the Muslims were an ungrateful people. “Anagarika Dharmapala fought for your universal franchise too; today you have laws that allow you to take four wives, we said then that if you have four, we have to be able to take at least seven wives,” he said, adding that a country had to have a single legal system that applied to all ethnic and religious groups. In a scathing attack on the more liberal members of the Sanga, Gnanasara Thero said that the only philosopher, socialist and democrat of the Bhikkus was Lord Buddha. He also called on Archbishop of Colombo Cardinal Malcom Ranjith to create a Catholic force of his own against evangelical Christians who were attempting to perpetuate Christian extremism in the country. The Buddhist extremist group has been leading the charge on virulent anti-Muslim sentiment spreading in Sri Lanka, that has led to several incidents against members of the Muslim community in recent weeks. Last week, Muslim shop owners in Narammala in the Kurunegala District received letters threatening them with death if they fail to vacate their places of business by 31 March. Crowds leaving the Bodu Bala Sena rally reacted angrily to a three member BBC film crew shooting in front of a Muslim-owned clothing store in Maharagama last evening and threatened them with violence, with police officers at the scene siding with the mob, crew members said. Heeding the advice of the mob police barricaded the crew and prevented their car from leaving the site of the commotion, BBC Sri Lanka Correspondent Charles Haviland said. “The police stopped our car from leaving until a police superior came and dispersed the mob and let us go,” Haviland said. Haviland said the BBC’s crew’s local members were verbally abused and that the mob behaviour was unsurprising but the conduct of the police had been extremely disturbing.